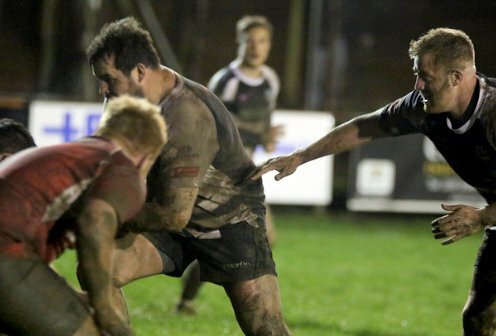 Persistent rain throughout the day left a wet and heavy field but Brynley Toms and his entire Bedwas Rugby teammates dug deep to secure another vital 18 – 10 win in the battle to avoid the end of season drop. Just as significantly Llanelli left the Bridgefield without any bonus points to see the gap between the two teams widen to eight points. With the wind and rain on their backs Llanelli started strongly but resolute Bedwas defense kept them from scoring although that defense came at a cost with the loss through injury of flanker Jonathan Armitage through injury after only 9 minutes. His replacement young forward Liam Beer took his opportunity to impress all with an excellent contribution to the cause. After repelling the initial Llanelli attacks it was Bedwas who got the first points of the evening via a Joseph Scrivens penalty. Llanelli almost immediately had a chance to equalize but full back Leon Randell’s kick sailed wide. However he made amends less than five minutes later after Bedwas were adjudged offside. Bedwas responded quickly and decisively. Patient build up work by the pack was rewarded with a close range try from Jonathan Davies who squeezed over for a try which Scrivens duly converted to increase the lead. The remainder of the half became an arm wrestle with both sides cancelling each other out as well as making mistakes through mishandling a wet ball when opportunities arose. With the rain and wind abating at the start of the second half Bedwas opened brightly and increased their lead seven minutes after the restart. Quick hands and a clever flick from Tom Hoppe saw the ball in Adam Williams’ hands and he duly obliged by running in from 25 meters to dive in close to the corner flag. Scrivens’ conversion attempt went wide. Llanelli were not going to lie down and after persistent possession close to the Bedwas line second row Chris Long stretched out to score a try which with Randell’s conversion saw the home lead cut to five points. Any hope the visitors had of taking something from the game evaporated two minutes later after tight head prop Ryan Thomas was adjudged guilty of a no arms tackle to the head of Bedwas’ Gareth Allen. Referee Ben Whitehouse immediately brandishing the red card without any hesitation. After a few minutes of treatment Allen was able to carry on and Scrivens converted the ensuing penalty goal to increase the Bedwas lead to eight points. Both sides continued to battle hard but no further scores were added before the referee ended proceedings.